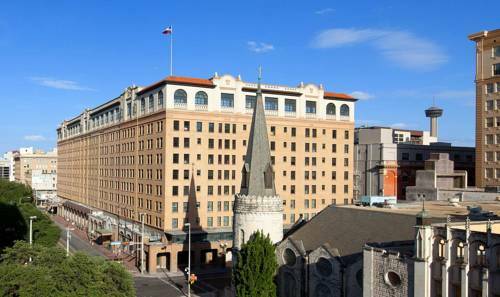 Built in 1909, The St. Anthony, San Antonio is located only three blocks from the Alamo and the vibrant Riverwalk. A multimillion-dollar renovation has preserved many period details of a luxury hotel that has welcomed politicians, royalty, and celebrities.The lobby boasts 16- to 18-foot ceilings, French d cor, and gold leaf-topped columns. Toast among marble and bronze works in the Swarovski-starred Sculpture Garden, dine under hand-cut crystal chandeliers, or clink glasses at the Sky Terrace overlooking the city.Our 277 inviting guest rooms including 29 spacious, unique suites have been updated in a chic, contemporary style. Original features blend seamlessly with modern amenities, including wireless High Speed Internet Access and glass-and-granite bathrooms. With one of the worlds most unique and celebrated addresses, our spectacular setting lends itself to rich and memorable travel experiences. Playfully named for the hotel s history, Haunt Lounge s chic, contemporary lounge atmosphere is ideal for casual gatherings and for catching the day s news and sports. Chef Stefan Bowers s signature menu is complemented by cold, refreshing cocktails. ReBelle s cuisine blends European techniques with bold, unique flavor pairings on individual and shared plates. Ingredients include coastal seafood shipped overnight, Texas-raised beef, and fresh produce from Texas s agricultural landscape. Once for members only, The St. Anthony Club offers a glimpse into a bygone era, accompanied by live jazz from a 1924 Steinway. Choose from casual plates and Texas-inspired libations, such as our signature drink, the Triple S.
With terrace seating that allows lovely views of Travis Park and the city, The Library Caf serves upscale American breakfast. Chef Michael Mata s creations and house-made pastries are complemented by Font micro-roasted coffee and tea. The open-air Pool Bar features pool and city views as well as a creative menu of refreshing cocktails and dining options. - Tesoro Alaska Petroleum Oil Co.
~4 miles from San Antonio. ~34 miles from San Antonio. A statue of a half-eaten watermelon in the city center signifies Dilley's rep as the Watermelon Capital of Texas. ~66 miles from San Antonio. ~73 miles from San Antonio.